So I kinda got caught up in the whole “cowpea” moment last week and decided I was gonna put my money where my mouth is, so to speak. I mentioned that growing cowpeas was so easy it could be done on a commercial break without any hassle… so, in addition to my container planted Red Rippers and Chinese Red Noodles, I did a little guerrilla gardening. Yep, I live in an apartment community, and while my neighbors and management have been very cool about my container gardening spilling over and outside my patio, I’m not sure how they would feel about me planting vegetables in the ground amongst their landscaping. So we won’t tell them, will we? I took just a few minutes and and hoed a shallow trough an inch or so deep. This clay soil is so dry and hard, it broke into either powder or clods. I dropped a few seeds about an inch deep and six inches apart, covered as best I could with the rock hard clumps of soil and watered in. The biggest effort I did make was to cover the newly planted seeds with a thin layer of mulch. I wanted to try to keep the soil moist, but I didn’t want to deny the future seedlings any sunlight they might need. That was four days ago and… viola! The little guys made it through! I’m totally stoked! I can’t wait to see how they produce compared with their pampered container counterparts. I’ll keep you posted. 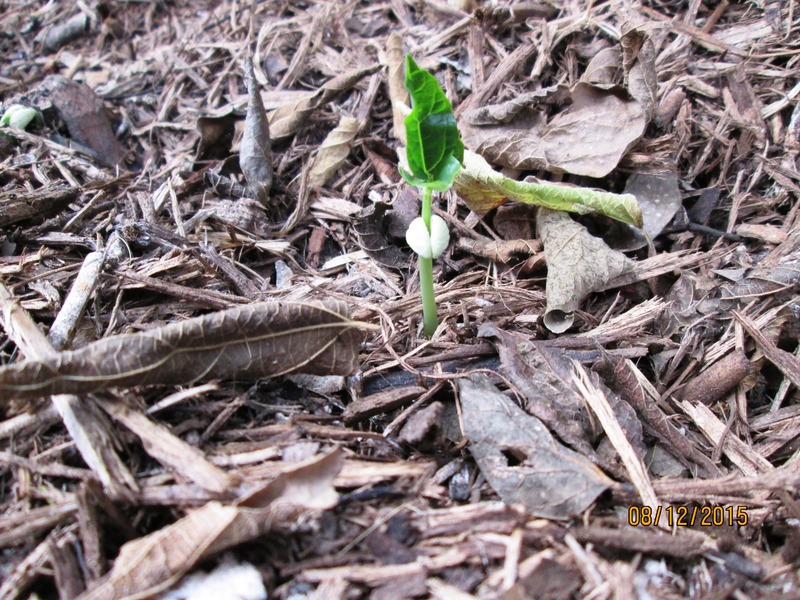 Did you get around to putting your cowpeas in? How are they doing? Alright, folks! If you haven’t put in those cowpeas, yet, now is the time. Yes, really, right now! Take that commercial break and jam a few cowpeas into the poorest soil in your garden, cover with soil and water in. Voila! Gardening done for the day! You and I can go back to watching the Criminal Minds marathon. Okay, so maybe that isn’t the best way to go about planting cowpeas in the garden, but given how well these bad boys do under the Texas heat and drought conditions, it’d probably still work. So let me tell you a bit about these cowpeas. Cowpeas make their way under quite a few aliases. They’re also called Southern peas and field peas and come in different varieties including creams and crowders. The best known cowpea is probably the black-eyed pea, but there are several others. I’ve grown pink eye purple hulls, red rippers and black crowders in my garden. Most are bush type plants that grow about three feet high, but there are a few climbers. The black crowders I planted in my patio garden grabbed onto one of my hanging planters and was looking for a way on to my neighbors’ balcony right before production halted! A different cultivar, the yardlong bean, or long-podded cowpea, grew ten-foot vines, and loads of pods. I was picking them at just over a foot long, but one did get lost under the stairwell and grew to about two feet long! Chances are good that even black-thumb gardeners are going to have success with cowpeas. They’re pretty low maintenance. They don’t like too much water or too much fertilization. Basically, until they’re bloomin’ and fruitin’, don’t pay ‘em too much mind. Cowpeas, like other legumes, develop a good bacteria on their roots that help them pull nitrogen right out of the air. They can also drill a tap root about eight feet deep, which helps them pull nutrients from deep in the soil and makes them incredibly drought resistant. This is the reason you don’t really need to fertilize them, and too much fertilization will just grow a lot of foliage and few beans, anyway. Plant your cowpea seeds about an inch deep in the soil. If you bought pea and bean inoculant, sprinkle a bit of that over the seeds and cover with soil. Remember that good bacteria I was talking about earlier? Well, it will get there naturally in its own sweet time, but if you want to push things along a bit faster, this stuff will help. Whether you use the powder or let the plant do it on its own, from that point on the soil will have this good bacteria living in it and you shouldn’t have to inoculate the soil again. Go ahead and water it in and wait for the magic to happen. In this August heat, I’d venture it would be just a few days before you see seedlings. These cowpeas are pretty tough and push through most soil like champs, but we have some serious clay in areas, so don’t let it crust over. They’ll need some light watering until they become established, but then you can pretty much ignore them until they start flowering. If you’re gardening in containers like I am, remember that our plants can’t drill a long tap root and will need more frequent watering than their terra firma counterparts. Either way, once those flowers bloom, they’ll need a little more water; and when the pea pods come in, they’ll need a little more water. 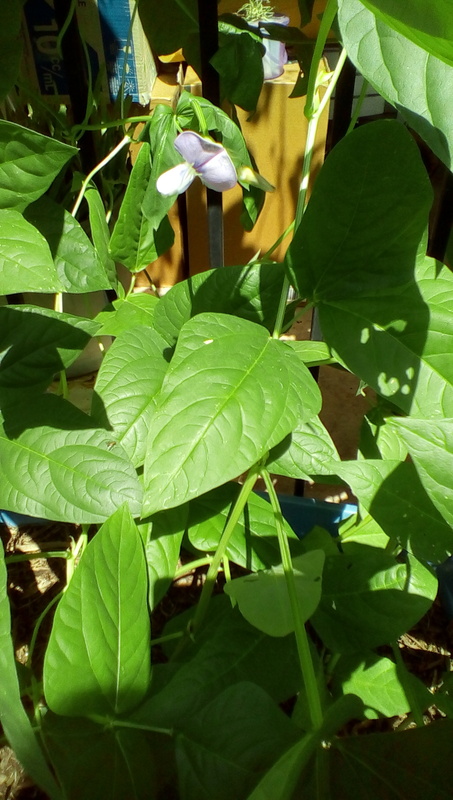 Remember, cowpeas and all the other delicious goodies in our garden are, just like our bodies, made up mostly of water. So when you have stuff fruiting, don’t drown ’em, but don’t be chintzy with the water, either. Now just stand back and let them do their thing! Cowpea pods can be eaten like snap peas when young. Leave them on a little longer and the beans will fatten up and you can use those as a fresh shell peas, or just let them dry on the vine and you’ll have a nice dry pea for storage. If you want them to keep producing, keep them picked. At some point, it will seem like they’re done producing, but they’ll get a second flush of pods. If you want to help those along, just add a wee bit of fertilizer or some compost. I’d wish you luck, but you won’t need it. These plants love this purgatorial south central Texas weather.